A new tabletop card game AND classroom resource aimed at teaching your students key social studies vocabulary in an engaging, competitive & creative way. Easy-to-learn game steps, quick-hitting clues & dynamic game play make FRECK! a must-have for every history classroom. Gregg & Mat, two history teaching colleagues enjoy teaching US history, but they've looked around over the years to try and find an alternative to the boring, same ol' resources companies were putting out there. All they found were flashcards, the "I Have Who Has" decks and other yawners. So, they came up with their own solution. FRECK! in History. It offers educators a fresh new way to strengthen student understanding of the content & process terms found in state social studies standards. First off, the word FRECK means "to be nimble, ready or strong." It's important for kids to be exactly that... ready & strong in history vocabulary. We also think it stands for "Fluid Recognition of Essential Content Knowledge." Even though it can be used as such, FRECK! IS NOT a set of flashcards. It's an awesome interactive tabletop card game and a WHOLE LOT more. You can integrate dynamic classroom activities for small, large groups or whole class settings (with more added by teachers all the time!) using the cards as a reference. That way, you don't have to write anything yourself. The content is built-in & easily accessible! OH... & it's a blast to play! FRECK! combines classic game play mechanics with clever, funny and challenging clues to make learning vocabulary more appealing to today's learners. It's fast-paced & simple to play. Something we teachers enjoy when it comes to setting up our classroom. Check out what teachers who've brought FRECK! into their classrooms are saying on our testimonials page. "Modern America" DECK | FRECK! 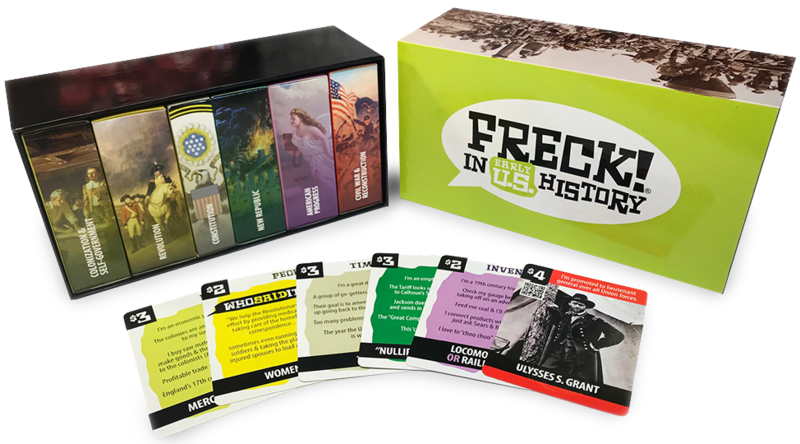 Modern U.S.
"Civil War and Reconstruction" DECK | FRECK! 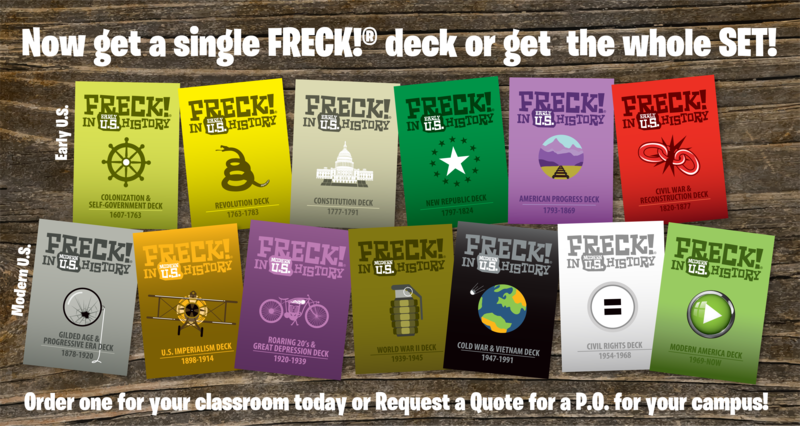 Early U.S.
"American Progress" DECK | FRECK! Early U.S.
"New Republic" DECK | FRECK! Early U.S.
"American Revolution" DECK | FRECK! Early U.S.
"Exploration and Colonization" DECK | FRECK! Early U.S.
"Civil Rights" DECK | FRECK! Modern U.S.
"Cold War & Vietnam" DECK | FRECK! Modern U.S.
"World War II" DECK | FRECK! Modern U.S.
"Roaring 20s & Great Depression" DECK | FRECK! Modern U.S.
"U.S. Imperialism" DECK | FRECK! Modern U.S.